This is one of the most exquisite, pristine Frank Sinatra autograph we have acquired. 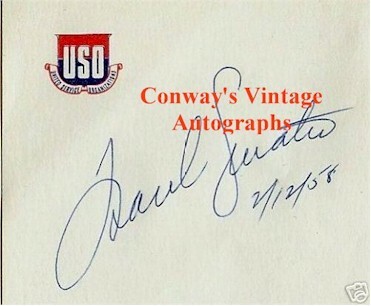 On vintage USO letterhead, most likely obtained during a USO support the military troops tour or performance. Sinatra was a big supporter of the military. Another super AUTHENTIC Frank Sinatra autograph from Conway's Vintage Movie Posters & Autographs. And, as always we guarantee our autographs for LIFE!